The CD160 molecule (BY55 antigen) is a 27-kDa, glycosyl phosphatidylinositol (GPI)-anchored glycoprotein of 181 amino acids, with a single immunoglobulin (Ig)-like domain. The molecule contains two potential sites for N-glycosylation and is rich in cysteine (6 residues in the mature polypeptide), indicating an important capacity for forming intra- and inter-chain disulfide bonds, which likely support the disulfide-linked multimeric (80 kDa) expression at the cell surface. Its expression is highly restricted to circulating cytotoxic T and NK cells, and in tissues, to intestinal intraepithelial lymphocytes, as revealed by CD160 mRNA blot analysis and various phenotyping studies. In peripheral blood, CD160+ cells consist of a majority of CD3– TCRγδ+ NK cells, which is significantly reduced in HIV+ individuals, and of a minority of CD3+ CD8bright T lymphocytes, which is significantly increased in HIV+ individuals. In bone marrow, CD160+ cells, though less abundant than in adult peripheral blood, also consist of the two populations observed in peripheral blood. In cord blood, CD160+ cells consist of a unique CD3– TCR– NK cell population, 80% of these cells being CD56+. CD160 is a ligand for classical and non-classical MHC-class I molecules. 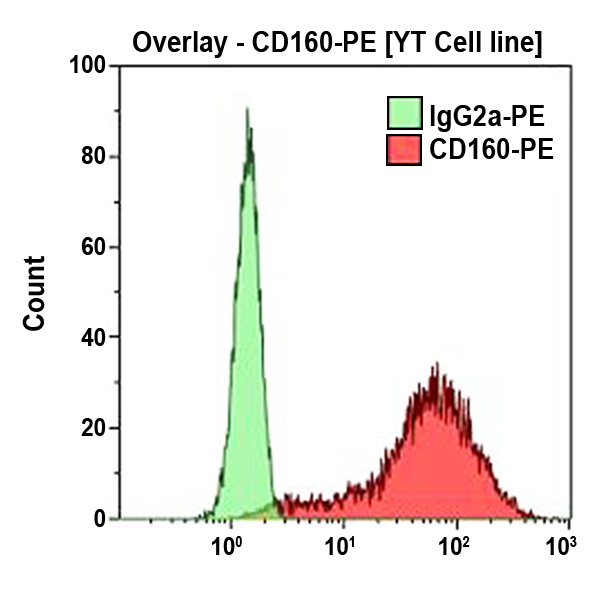 The ligation of MHC-class I by CD160 provides a costimulatory signal restricted to peripheral blood activated T cells, suggesting a pathway being additional and/or alternative to the CD28 costimulation mechanism. This pathway may be relevant in memory T cells that lack CD28, such as the intestinal intraepithelial lymphocytes. Clone Description The BY55 antibody was initially reported to react with a protein structure of 80 kDa exclusively expressed by circulating cytotoxic lymphocytes. It does not block the binding of the CD160 molecule to MHC-class I molecules.